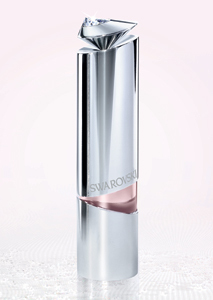 Swarovski is to launch its debut fragrance, Aura, along with a bath & body line and new crystal Make-up Jewels. The new fragrance has key notes comprising amber, benzoin, white musk and lychee and is presented in a unique crystal bottle specially created by Swarovski. The new scent is complimented with Perfumed Body Cream, Lotion, Shower Gel and Deodorant as well as Make-up Jewels that are available as asymmetrical pendants decorated with crystals in white and pink, depending on the colour of the make-up inside. The make-up, available in three textures, contains powdered, micronized Swarovski crystals and Crystal Shine pearls that fuse with skin to add luminosity. The new range will be available exclusively at Selfridges from 3 March and then nationwide at selected stores from 31 March priced between £22.00 and £71.00.